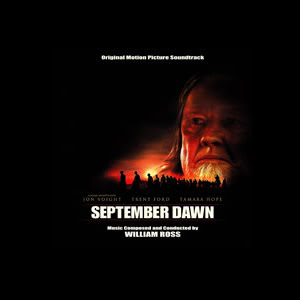 BuySoundtrax Records announces the release of the SEPTEMBER DAWN --Original Motion Picture Soundtrack composed by William Ross. The film, directed by Christopher Cain (Young Guns, Gone Fishing), is a Romeo and Juliet story set against the backdrop of the of the controversial real-life massacre of 120 men, women and children traveling through Utah. Composer William Ross wrote the original score for SEPTEMBER DAWN. Ross is a prolific, award winning composer and arranger whose work has spanned feature films, the recording industry and television. He has composed music for such films as Tuck Everlasting, My Dog Skip, Tin Cup, My Fellow Americans, and the IMAX film Young Black Stallion. Ross has orchestrated more than 100 films, including Matrix Reloaded, Forrest Gump, Stuart Little and The Father of the Bride. In 2007 he was Music Director for the 79th Academy Awards Special.